You won't feel like ‘A Sitting Duck' in this cute Duck vacation property! Close to the beach and located in quiet Sea Tern, just north of Duck Village. Your crew will relax, make memories, and enjoy the beach in a great setting. The top deck offers a nice view of the ocean and great ocean breezes. Inside, you will find a beautiful property with appealing bedroom furnishings and a wonderful outfitted kitchen. The kitchen has stainless steel appliances. Owners, that use the property often, have stocked a ‘family-friendly' kitchen just off the Great Room so everyone can enjoy time together. Meals are shared at the dining table and breakfast bar, or grill and eat at the picnic table on the ground level outside! There is a great multi-use path for biking, jogging or just strolling with the kids. ‘A Sitting Duck' is located right between Duck Village and Corolla so you can have all the shopping and family activities you desire. Want to make a lasting memory? Take everyone to Corolla for a tour of the Historic Corolla Lighthouse, or head to the 4x4 area for a Wild Horse Tour. Take a kayak tour along the sound in Duck, or just stroll around the village boardwalk and enjoy drinks, coffee and restaurants. . .from BBQ to 5 Star Dining! (Elevator is not operational). Top-Level: Great Room with LCD TV, Deck Access with Ocean Views, Kitchen with Bar seats 2, Stainless Steel Appliances, Dining Table seats 6, Half Bathroom. Mid-Level: Bedroom with 2 Twins and LCD TV; Bedroom with 2 Twins and LCD TV; Queen Master with LCD TV and Deck Access; Queen Bedroom with LCD TV and Deck Access, shares access to Hall Bathroom, Washer/Dryer. 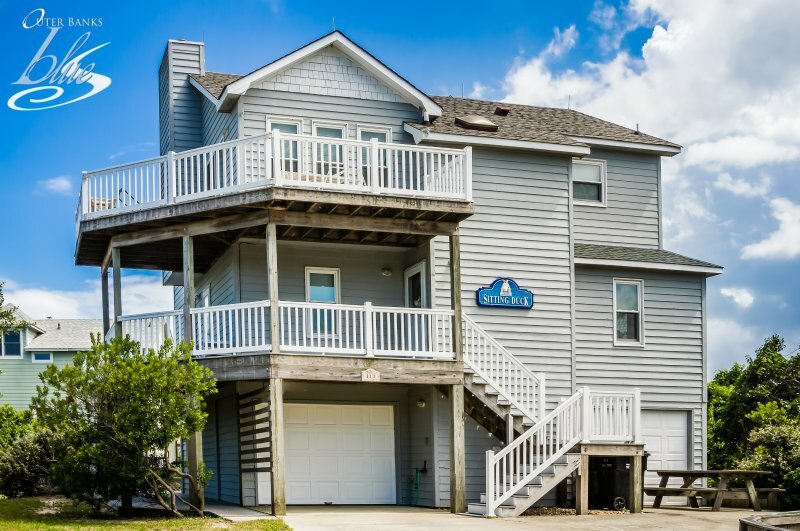 Extras: Wireless Internet Access, Stereo, High Chair, Beach Cart, No Smoking, PETS NOT ALLOWED, Parking: 3 Cars, Distance to the Beach: 460 ft.
You won't feel like ‘A Sitting Duck' in this cute Duck vacation property! Close to the beach and located in quiet Sea Tern, just north of Duck Village. Your crew will relax, make memories, and enjoy the beach in a great setting. The top deck offers a nice view of the ocean and great ocean breezes. Inside, you will find a beautiful property with appealing bedroom furnishings and a wonderful outfitted kitchen. The kitchen has stainless steel appliances. Owners, that use the property often, have stocked a ‘family-friendly' kitchen just off the Great Room so everyone can enjoy time together. Meals are shared at the dining table and breakfast bar, or grill and eat at the picnic table on the ground level outside! There is a great multi-use path for biking, jogging or just strolling with the kids. ‘A Sitting Duck' is located right between Duck Village and Corolla so you can have all the shopping and family activities you desire. Want to make a lasting memory? Take everyone to Corolla for a tour of the Historic Corolla Lighthouse, or head to the 4x4 area for a Wild Horse Tour. Take a kayak tour along the sound in Duck, or just stroll around the village boardwalk and enjoy drinks, coffee and restaurants. . .from BBQ to 5 Star Dining! (Elevator is not operational). Top-Level: Great Room with LCD TV, Deck Access with Ocean Views, Kitchen with Bar seats 2, Stainless Steel Appliances, Dining Table seats 6, Half Bathroom. Mid-Level: Bedroom with 2 Twins and LCD TV; Bedroom with 2 Twins and LCD TV; Queen Master with LCD TV and Deck Access; Queen Bedroom with LCD TV and Deck Access, shares access to Hall Bathroom, Washer/Dryer. Ground-Level: Enclosed Garage, Outdoor shower in garage, Picnic Table Extras: Wireless Internet Access, Stereo, High Chair, Beach Cart, No Smoking, PETS NOT ALLOWED, Parking: 3 Cars, Distance to the Beach: 460 ft. All Outer Banks Blue properties provide bed linens, bath towels, beds made prior to your arrival, and a starter supply of: toilet paper, bathroom soap, paper towels, and dishwater detergent. Discounted H2OBX Water Park tickets available when you book with Outer Banks Blue.